This sign on Dyckman St. is located in Inwood just around the corner from Harry Middleton's original Mack Sign Co., at 4844 Broadway near Academy St.
Mack painted many other McDonald's signs, including one on 1st Ave. near 2nd St. (Click here for image.) Color, design and lettering are basically the same. Bob Middleton painted both signs. About the 1st Ave. location Bob writes "I remember working on this wall with my father around 1956 for a Loan Shop on 2nd Ave. We were very busy at this time with all the Bendix signs, and all the other signs. We finished the sign, lowered all the equipment onto a one story taxpayer under the sign and figured on picking up this equipment later in the week. About six months later the owner of the, I believe a Dry-Cleaning store called to tell us if we didn't remove the scaffold and all the rope falls and Irons he was going to sell them. My father blamed me for forgetting to pick up the scaffold and at that time I was on the payroll, just another worker, so I blamed the boss, Harry Middleton." 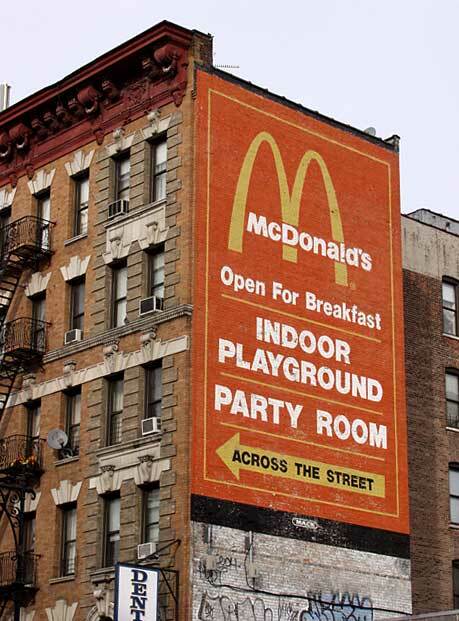 The McDonald's signs were painted in the 1970s, likely around 1978.